There’s no debate about it, movies based on video games usually don’t cut it. If you’re looking for evidence, just feast your eyes on the list of big budget misfires and failed ventures that have transpired over the last few decades. From the tatty Super Mario Bros. (1993) to Doom (2005) — which I actually didn’t mind — to 2001’s clunky Lara Croft: Tomb Raider. Even the misguided Prince of Persia: The Sands of Time (2010) proved disappointing for both fans and executives alike. And don’t get me started on those Resident Evil flicks! That said, Rovio Entertainment’s 2009 puzzle-orientated smartphone/tablet app Angry Birds didn’t strike me as ripe material for a big-screen adaptation either, even though its toon shorts were mildly amusing. Thankfully, with little in the way of an established mythos, animation veterans Clay Kaytis and Fergal Reilly (in their directorial debuts) have been blessed with the advantage of taking the game’s already iconic characters and essentially doing whatever they wanted with them. If you’ve never downloaded or played any of the thirteen Angry Birds apps (my favorite being the RPG installment, Angry Birds Epic) the basic idea is pretty simple: using Newtonian physics and a slingshot, it’s the player’s objective to retrieve stolen eggs by flinging multi-colored, ability driven birds into wobbly structures built by evil neon-green pigs intent on eating the said eggs. 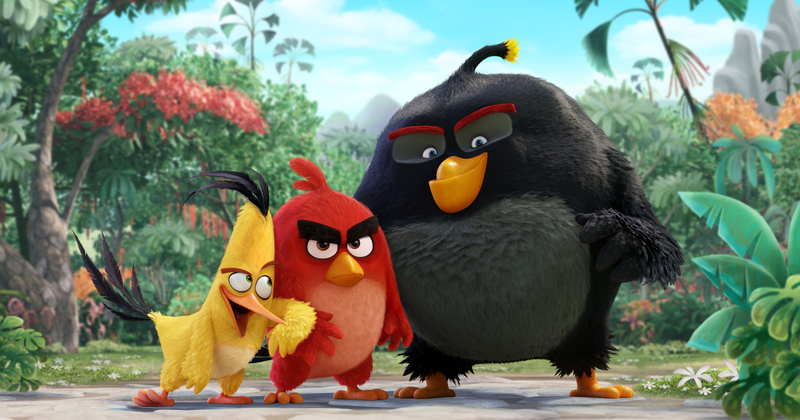 The Angry Birds Movie takes this simple premise and fleshes it out: the result, a highly polished turbulent adventure that’s light on plot but high on slapstick playfulness. The picture opens on a tropical isle named Bird Island; a carefree paradise populated by flightless, happy-go-lucky birds — well almost entirely. Enter short-tempered protagonist Red (voiced by Jason Sudeikis) who’s frowned upon by the merry residents of the island for his lack of cheer and ordered by the court to attend anger-management classes run by a white teardrop-shaped Chicken named Matilda (Maya Rudolph supplying the vocals). There Red meets a speedster canary named Chuck (Josh Gad in his first animated role since 2013’s Frozen), a volatile blackbird who literally explodes whenever he gets stressed, named err, Bomb (a perfectly apt Danny McBride), and the intimidatingly irate Terence (whose groans and grunts must have made an easy penny for Sean Penn). However, when a boatload of green porkers stopover, dropping their anchor directly onto our hero’s secluded home, Red and his newfound pals take it upon themselves to investigate the visitors’ mysterious appearance as they begin to suspect that something suspicious is afoot. 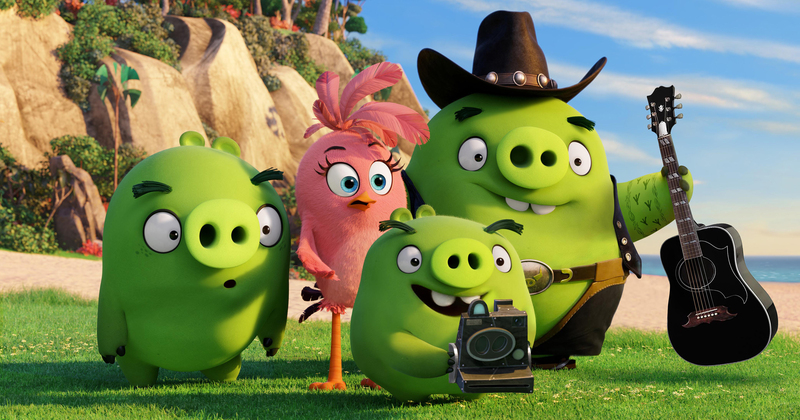 Even with its zippy 95-minute runtime, The Angry Birds Movie struggles to find its aim until about two thirds in, when the pigs finally show their true colors and nab the eggs right out from under the flapper’s beaks. Before this critical moment, we’re given several amusing sequences including the flock’s backstories and a number of clever meta references, sight gags, game winks and adult-aimed jokes. There’s a crafty photo-bombing pun, a quip that sees a mommy bird prepare her chicks’ lunches by regurgitating food into paper bags, along with nods to French electronic duo Daft Punk and the 1980 cult hit The Shining. With several of these rib-ticklers hitting their mark and others missing it, this quasi Family Guy approach sometimes feels a bit tiresome. Screenwriter Jon Vitti, The Simpsons Movie (2007), also finds a way to make good use of Mighty Eagle, who (in the app) is summoned by sardines to wipe out entire levels of enemies. Voiced by a plucky Peter Dinklage, Pixels (2015), scenes at the soaring figure’s Shangri-La type lair are a blast, particularly a sequence that sees Chuck and Bomb bathe in the Lake of Wisdom, which concludes in a shocking revelation, and another, with the reclusive Eagle forcing the trio to recite his famed theme song. Nevertheless, the picture truly sores when its third act hits, with a show-stopping climax that plays out like an amped-up version of the titular game. Traveling to Piggy Island — a metropolis filled with intricate Rube Goldberg type structures and gadgets — the now ‘angry’ birds decide to fire themselves into the city (aiming to hit the fortress) as they fight to recover their eggs, destroying the piggies’ domain in the process. What’s more, when the swine leader, Leonard (a solid Bill Hader) — a maniacal loon with hair on his chinny-chin-chin — retaliates in an all-out assault, it’s game on for our anthropomorphic heroes. With a dynamically animated bird’s-eye-attack, it’s clear that filmmakers have spent the majority of their time and money in getting this portion of the feature right — and it honestly shows. Not only is this confrontation visually outstanding and uber-exciting, but every critter gets their moment to ‘fly,’ even lesser known characters such as the orange oriole Bubbles (Anthony Padilla), the pink galah Stella (Kate McKinnon) and the boomerang toucanet Hal (Ian Hecox). It’s just a shame that this unruly sorta game-play wasn’t spread throughout the rest of the film. Oddly enough, the picture’s plot (if skewed) could lend itself towards an allegory of the Islamic invasion of Europe or Islamophobia — an analogy that will no doubt go over the kiddie’s heads. Given the current political climate, it’s hard to ignore little details such as the three protagonists sharing the exact colors of the German flag or Great Eagle (with his patriotic song) symbolizing lazy America. More troubling is the antagonistic spearhead Leonard, who sports a Mohammed-type beard while the porkers themselves are depicted as ‘refugees’ who are smuggled onto Bird Island, eventually destroying the town, literally taking the citizen’s futures away. Then there’s the final retaliation with our feathered friends blowing Piggy Island to smithereens. Absurd theory or an extended anti-immigrant metaphor, you decide! 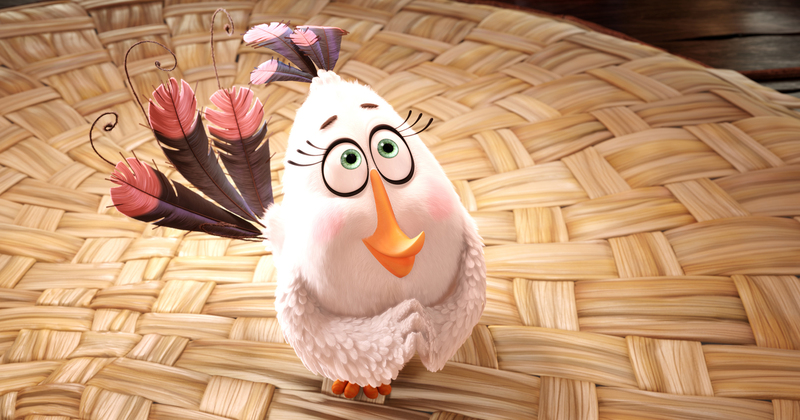 Concluding with the obligatory dance number, The Angry Birds Movie at least tries to instil a positive message about using our displaced anger for good rather than lashing out at those around us, along with the usual fluff for youngsters about family and acceptance. Although arriving about five years too late, The Angry Birds Movie somehow manages to break free from the genre’s notorious stigma, one that’s left many of us cynical or umm, ‘angry.’ With eggcellent animation, faithful design work and a pitch-perfect voice cast, The Angry Birds Movie finds fun in its own contrived Looney Tunes outrageousness. Seriously, why would anyone leave large piles of TNT lying around?